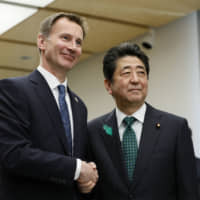 Prime Minister Shinzo Abe on Monday asked the U.K. to minimize the negative impact of its departure from the European Union on Japanese companies and the broader global economy. 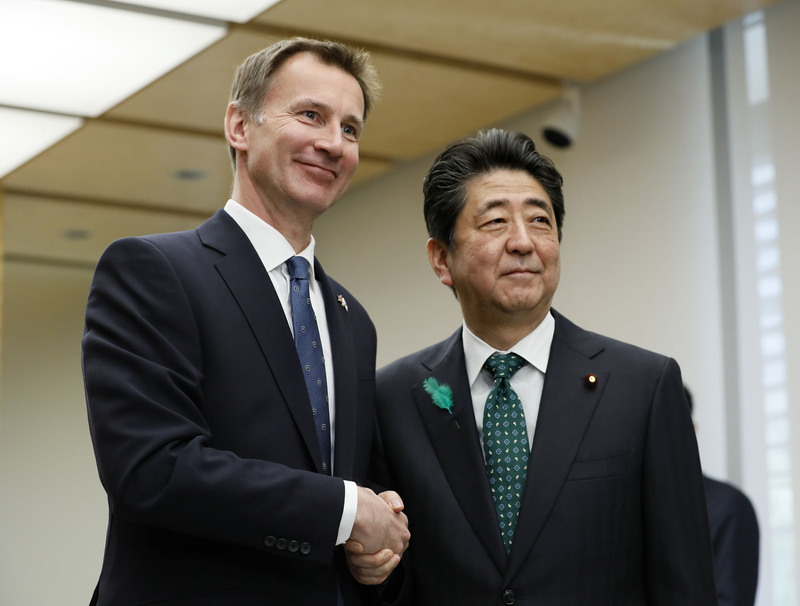 During a meeting with British Foreign Secretary Jeremy Hunt in Tokyo, Abe said Japan welcomes the fact that a “no deal” Brexit was avoided after the U.K. and the European Union agreed last week to extend the deadline again for the so-called British exit from the bloc to Oct. 31 from April 12. May has struggled in recent weeks to win parliamentary support for the deal she negotiated with the other 27 EU members, raising fears of a no-deal exit disrupting business activities. Japanese manufacturers, including Toyota Motor Corp. and Nissan Motor Co., have production plants in Britain. “We want that strong cooperation to continue,” the British foreign secretary said. During the meeting, Abe also sought British support when Tokyo hosts the Group of 20 summit in Osaka in June. Tokyo hopes to lead discussions on turning innovation and free trade into drivers of economic growth, among other global challenges.